Although Switzerland has never been regarded as a hotbed of metal, the country has produced a number of interesting acts in the past, and now to that list can be added Ticket To The Moon. 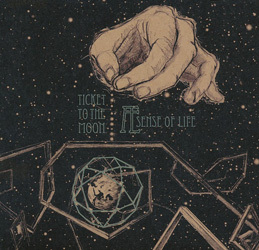 Progressive by name and hugely progressive by nature, Ticket To the Moon are a four-piece band from Basel, and their recently-released second album ‘AE Sense Of Life’ is an exceptionally moving body of work. 3TM – as they call themselves – was originally formed by drummer/vocalist Daniel Gosteli and guitarist/vocalist Andrea Portapia (or Danny and Andy to their mates) but it wasn’t until keyboard player Matthias (Matt) Zwick and bassist Guillaume (Gys) Carbonneau joined in 2007 that the band became the full ticket [sorry!]. ‘Dilemma On Earth’ opened their account in 2012, and with ‘AE Sense Of Life’ 3TM seem set to seal their reputation as one of the most exciting bands to emerge from the progressive metal scene in a long time. Largely introspective lyrically, but widely expansive musically, ‘AE Sense Of Life’ is a vast, sprawling body of work, and if you want a musical point of reference Dream Theater’s ‘Scenes From A Memory’ is probably the closest that springs to mind. There are ten tracks listed on the sleeve but the album is actually described as “four songs and one instrumental concept” which deal with the matters of life and death that makes us human, and consequently 3TM aren’t afraid to challenge their audience. Lyrically and musically they paint their canvas with the whole spectrum of light and shade, with moments of pure tranquillity violated by aggressive, hacking guitar work and bursts of belligerence punctured by pure serenity. There’s so much to commend, so many moments of sheer brilliance, that to throw the spotlight onto any track or tracks is a very difficult thing to do, especially as the album demands to be listened to as a single body of work. However, the instrumental ‘Patient 730100 (Resurrection)’ is a personal highlight, and the labyrinthine ten-minute ‘Foetus’ with its nightmare lyrics and capacious instrumental work-out is a complete and utter joy. And to cap a hugely poignant album, ‘AE Sense Of Life’ plays out with ‘Hynkel’. The clue’s in the title; Hynkel is the dictator in Charlie Chaplin’s film ‘The Great Dictator’, and the song itself is an instrumental which backs the film’s keynote speech, an impassioned plea for peace and tolerance, no less relevant now that it was in 1940. It surely can’t be long before one of the bigger labels seizes on this band and 3TM do indeed earn their ticket to the moon – or maybe the stars if they continue to make albums this good). In the meantime, this is a band everyone should hear. Trust me on this.